Italian-made stainless steel shaver makes elegant chocolate curls. 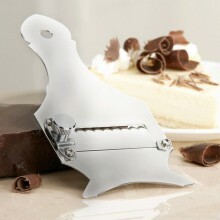 Razor-sharp serrated blade adjusts from paper-thin to .13" - perfect for ingredients and garnishes. Won't absorb flavors when shaving truffles. Click the button below to add the Chocolate Truffle Shaver made in Italy to your wish list.